We were pleased to host Harrison Kruse's 13th birthday party. 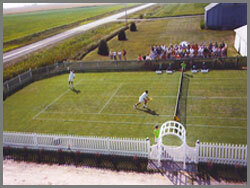 Harrison and his buddies play out of the Aspen Tennis Club in Des Moines, IA. 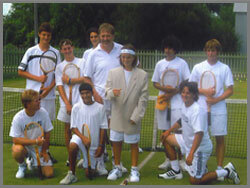 Note the linen jacket Harrison is wearing (ala Roger Federer), the appropriate tennis whites and the "woodies." These guys really know how to party! 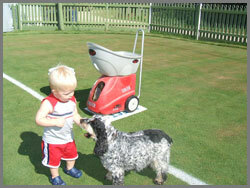 Cooper, an English Cocker, and Ellie, a Field Spaniel, are the offical dogs of the AILTC. 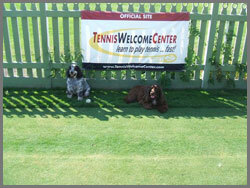 Please leave your dogs at home when visiting the AILTC. 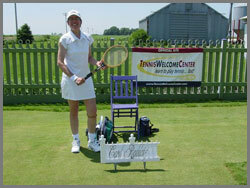 Carol Raddatz from Watertown, WI was one of our first guests. She and her husband, Keith, presented us with a lovely scrapbook that is on display in the "Royal Box" at the AILTC. 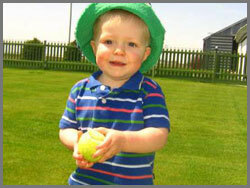 Grandson Rylan, nicknamed "The Rocket", loves all kinds of balls and throws left handed. 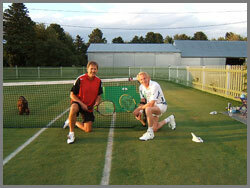 Maybe he will become the next Rod Laver. 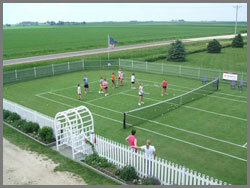 The next generation of Kuhn family tennis players is on the way! Shown from left to right are Mason & Lori and their son Tristan, and Melissa & Alex and their son Rylan. 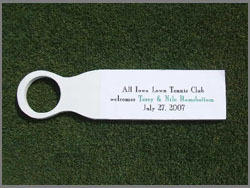 Personalized souvenir pickets are available. 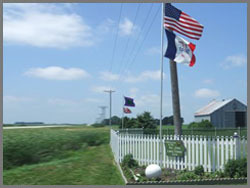 "Old Glory", the flag of the state of Iowa, and the AILTC club flag fly every day in season. During the Championships at Wimbledon and on other special occasions we also fly the "Union Jack". 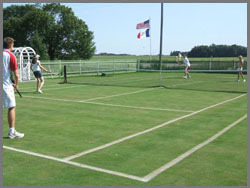 The Charles City YMCA youth tennis league enjoys hitting at the AILTC every year. 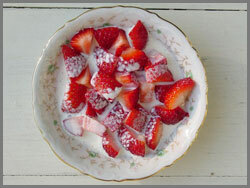 Yes, we do serve homegrown strawberries & cream in season! 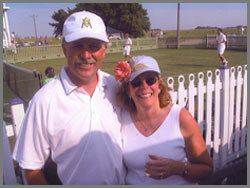 Mark & Denise Kuhn welcome you!